Home » How To » How To Install Galaxy S8 Launcher & Bixby on Galaxy S7 Edge with Nougat? How To Install Galaxy S8 Launcher & Bixby on Galaxy S7 Edge with Nougat? Apparently, Bixby is one of the finest features in the Samsung galaxy S8, apart from its infinity display, biometric features and dual-audio option via Bluetooth. Although this feature has been taken from the Google Now, Apple Siri or Microsoft Cortana, but Samsung is hoping to take it over with its additional next level features. How to Install Galaxy S8 Launcher & Bixby on Galaxy S7 / S7 Edge? Being a virtual assistance, Bixby is destined to make the life of the user of Galaxy S8 easier by letting them a lot of things using voice control. Apart from showing the user with the contextual information based on his daily usage habits, Bixby can Talk, See, Recommend and Remind as well. 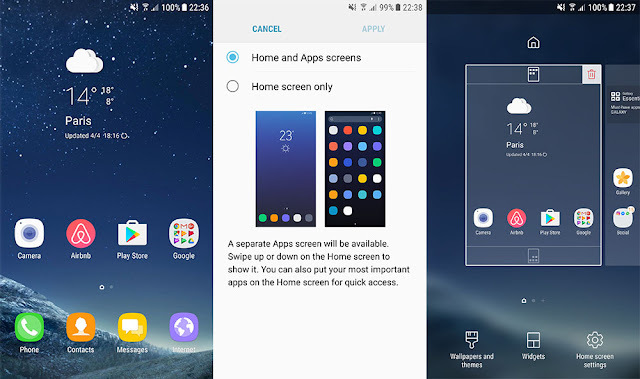 Moreover, Samsung Galaxy S8 also has got the new flashy launcher that features amazing ability to disable the app drawer and a dedicated screen for Bixby. If you are impressed with these features of Samsung Galaxy S8 and don’t feel like waiting or wondering to upgrade your phone from Galaxy S7 and S7 Edge to S8, there’s a great news for you all. You can enjoy these features of Bixby and S8 Launcher on your Galaxy S7 and S7 Edge right now, without having to wait for the S8 to out in the market. The only thing that you need to have on your Galaxy S7 and S7 Edge is just a Nougat Update. Step # 1: Make sure that you have Android Nougat 7.0 on your Galaxy S7 or Edge phone. Step # 2: Download the two APK Files for Bixby and S8 Launcher. Step # 3: Once the downloading process is done, install the files by tapping on “Download File”. Step # 4: After downloading, you have to check “Unknown Sources” ON in order to install. Step # 5: Once installed, you will notice that you have Galaxy S8 Launcher and Bixby on your Samsung Galaxy S7 Edge. Step # 6: Reboot the phone, after installing both the files. Step # 7: After rebooting the phone, swipe left and you will find Bixby running. Press the Home Button and you will find the whole new interface of your phone. There will be no app button but you can swipe up from anywhere on the home screen to pull the notification panel. You can also uninstall the launcher and Bixby by going into Settings » Applications and uninstalling updates to the TouchWiz Home app. Q: Why does Galaxy S8 Launcher Force Closes on my Galaxy S7 / Edge with Nougat? 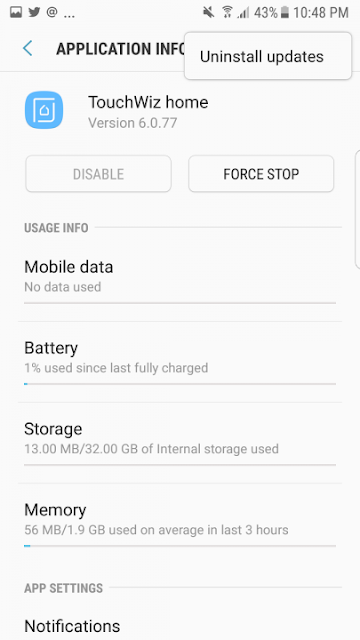 A: You need to Clear the Data and Cache of TouchWiz Home app from App Manager. 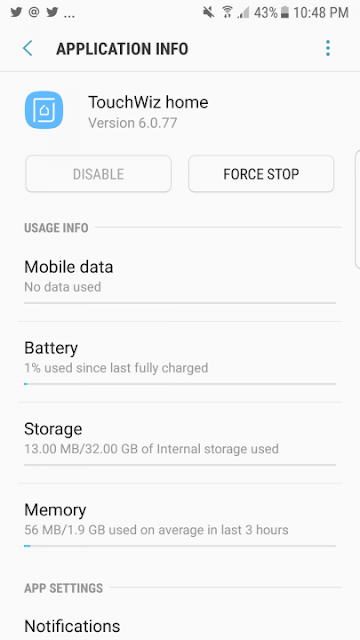 Scroll down Notifications Panel, Click on Settings Icon ->Applications->TouchWiz Home then click Storage and then Clear Data & Cache. Now your force close error on Galaxy S7 Edge with Galaxy S8 Launcher on Android Nougat will be gone. Q: How to uninstall Galaxy S8 Launcher & Bixby from my S7 / Edge with Nougat? A: Scroll down Notifications Panel, Click on Settings Icon ->Applications->TouchWiz Home then click on the 3-dot menu button at top-right then click “Uninstall Updates”. You have to enable installation of apk from unknown sources from settings of your phone, to install these apk files on your Galaxy S7 / Edge. They work fine on Android Nougat 7.0. Make sure your OS version is 7.0 Nougat. can’t install. it says the package conflicts with the original package.